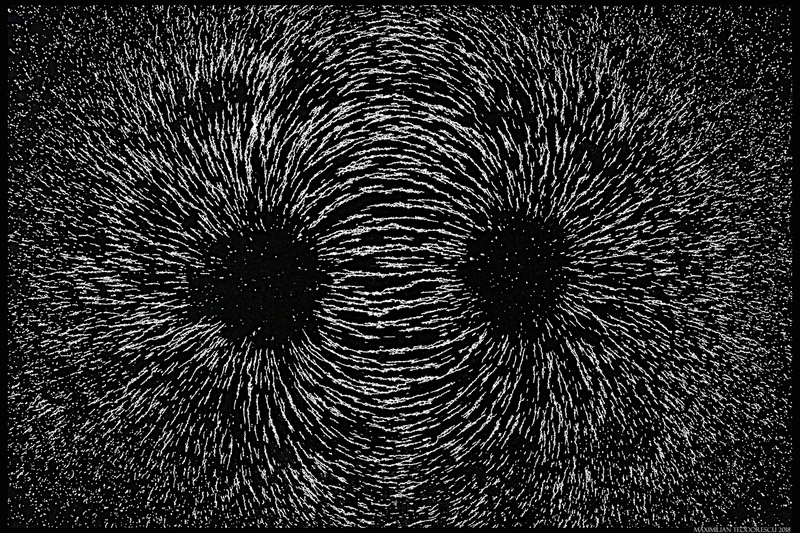 Just playing a bit with some magnets, iron filings, and a piece of paper. I’ve wanted to take a few shots of this practical experiment for some years now. 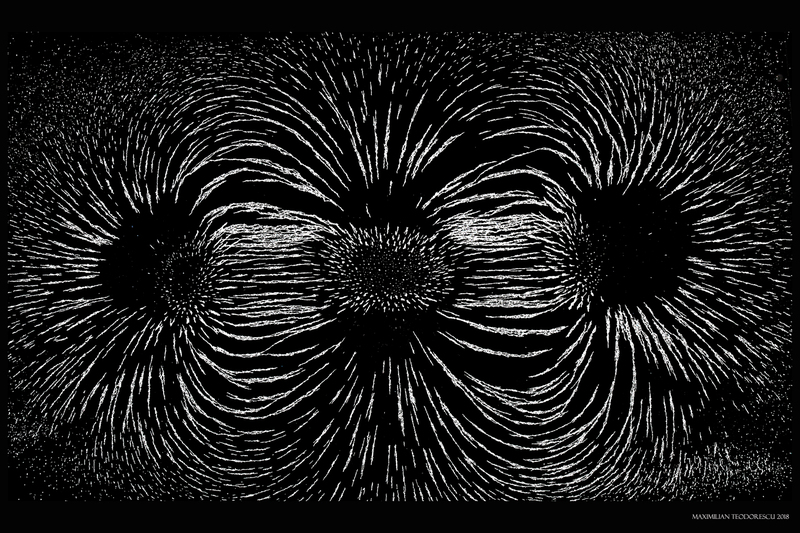 Finally I had the inspiration to do it..
All shots are negatives of the originals, since to my eyes, the magnetic field lines show better this way. 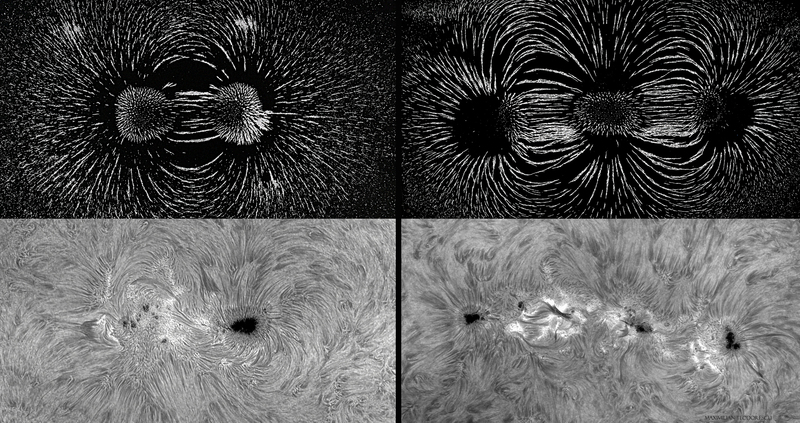 And a comparison of some homemade magnetic field lines and the aspect of some sunspot groups in H-alpha light. 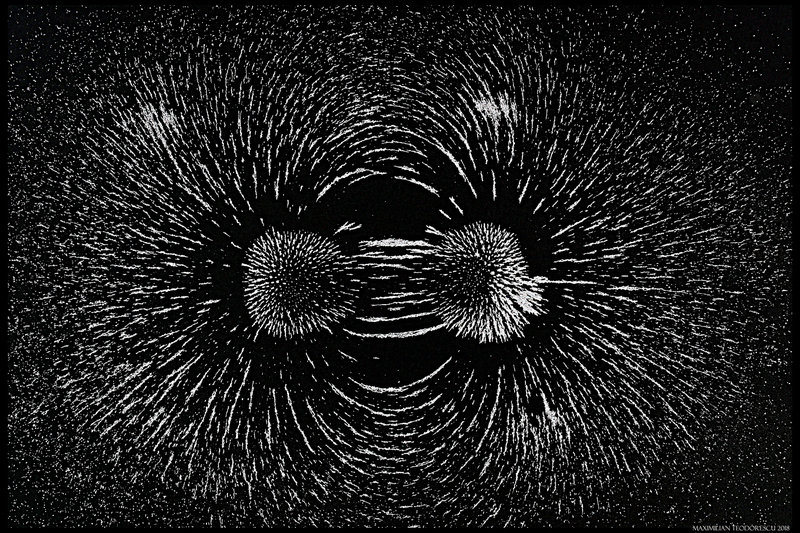 Note the similarities. 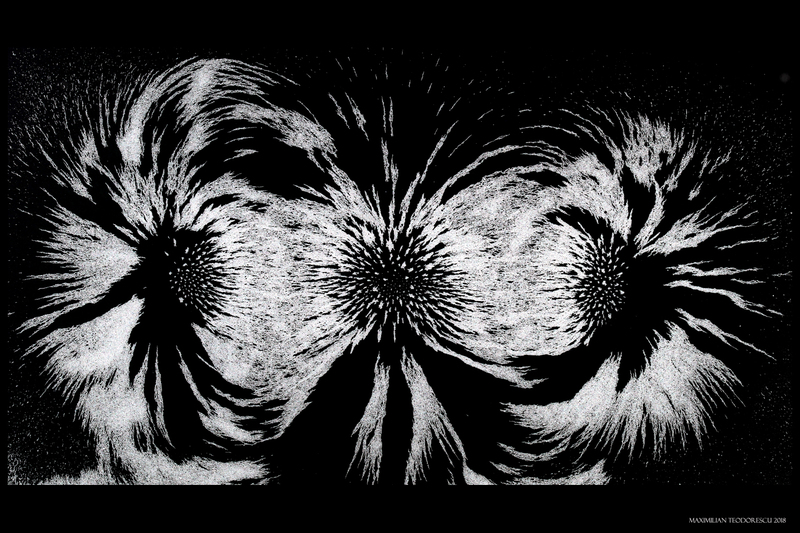 They might not be the best examples, but they are my only ones showing similar structures on the Sun. 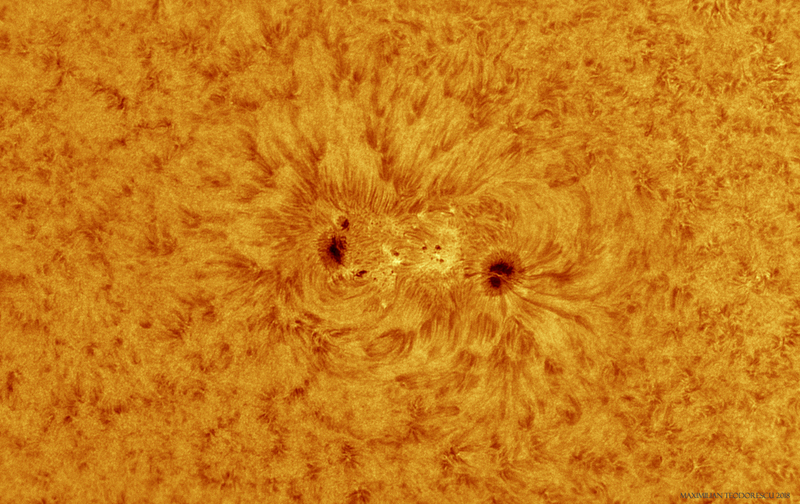 Just a very short imaging session with the Sun in H-alpha light. Very poor seeing and session cut short due to rolling clouds. Two inches of snow…just 80 km from home (I have no snow here). Just a Sunday joke…for lunar and SpaceX enthusiasts. 355mm F/4.5 Newtonian, 2x and 2.5x barlow lenses, ASI174MM, red filter. 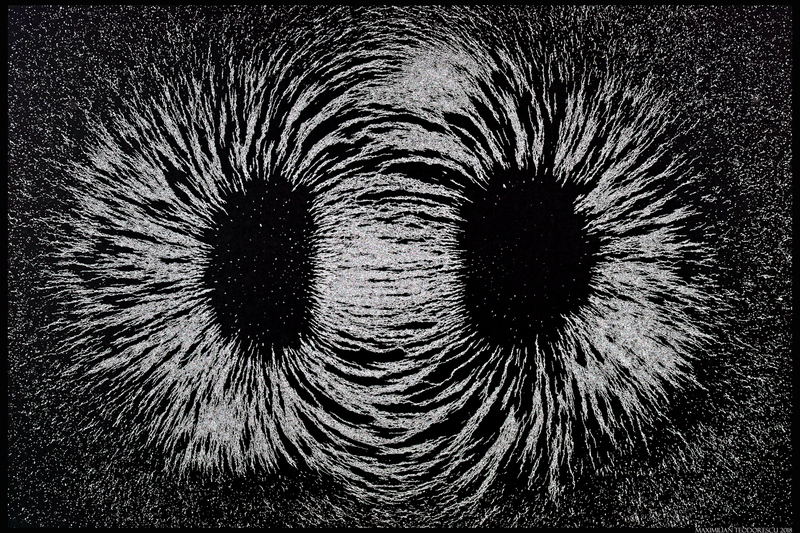 Seeing : variable, 5-7/10. Despite being at the solar minimum, our star produced a new active region. Of course, imaging it is a bit difficult due both to the low altitude of the Sun, and to the turbulence in the air associated with this time of the year. Still, a couple of shots were possible. Equipment: (February 9) 150mm F/5 refractor, Quark H-alpha filter, ASI 174MM, seeing 3/10. (February 10) 115mm F/7 refractor, Quark H-alpha filter, ASI 174MM, seeing 5/10. 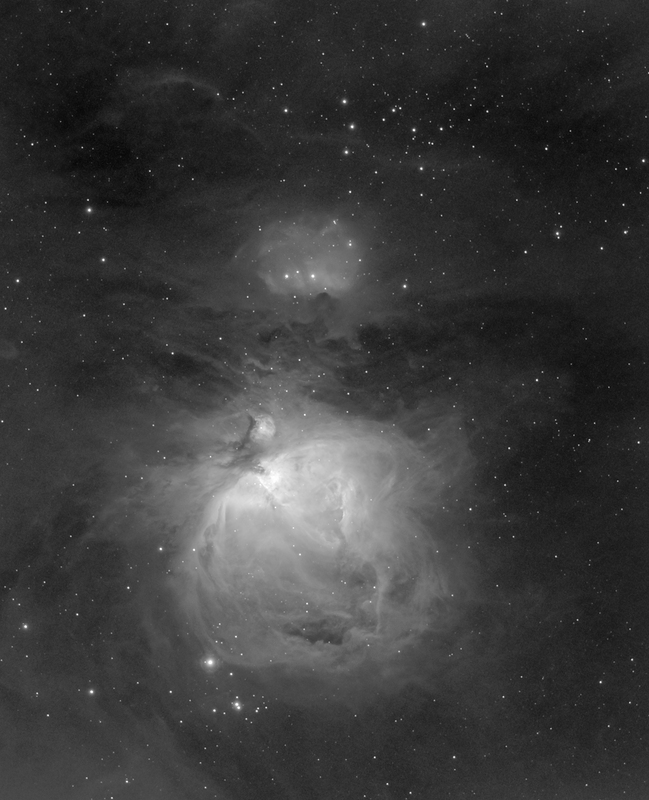 Following is my first test showing the Orion Nebula in H-alpha. 14 frames each a 5 minutes exposure (gain 200) were acquired with the TS 65Q APO Refractor and ASI1600MM camera with a Baader 7nm H-alpha filter. No darks, no flats. 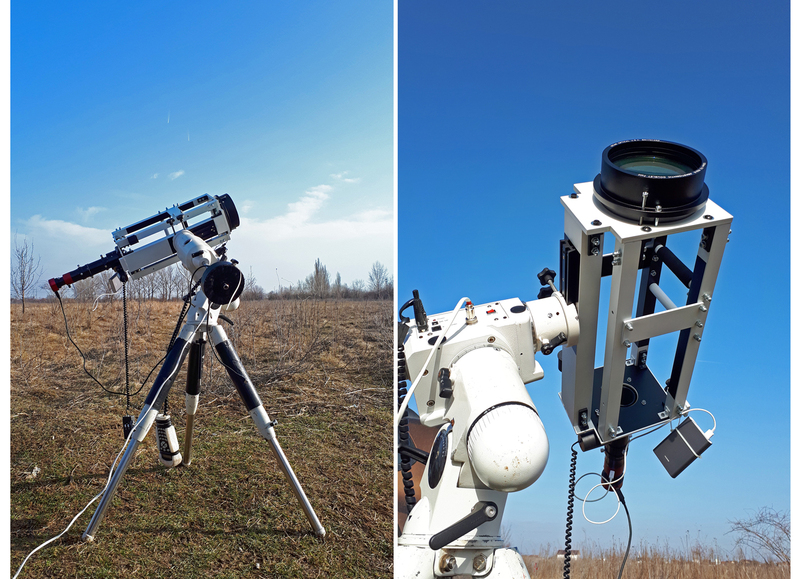 Guiding via PHD2 and a 50mm finderscope with the ASI174MM. 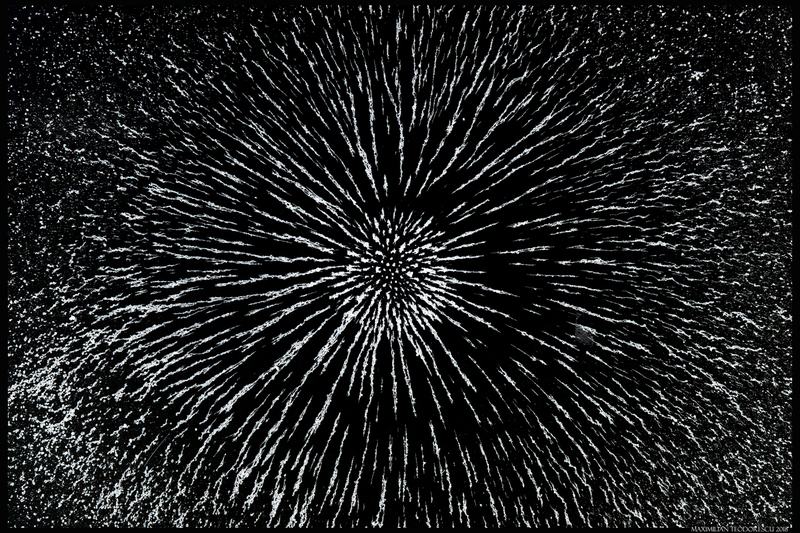 Another 34 frames of 10 seconds each were recorder for the inner region of the nebula. I will need at least 3-4 hours more of data to get a proper view of the area. For now…a test. 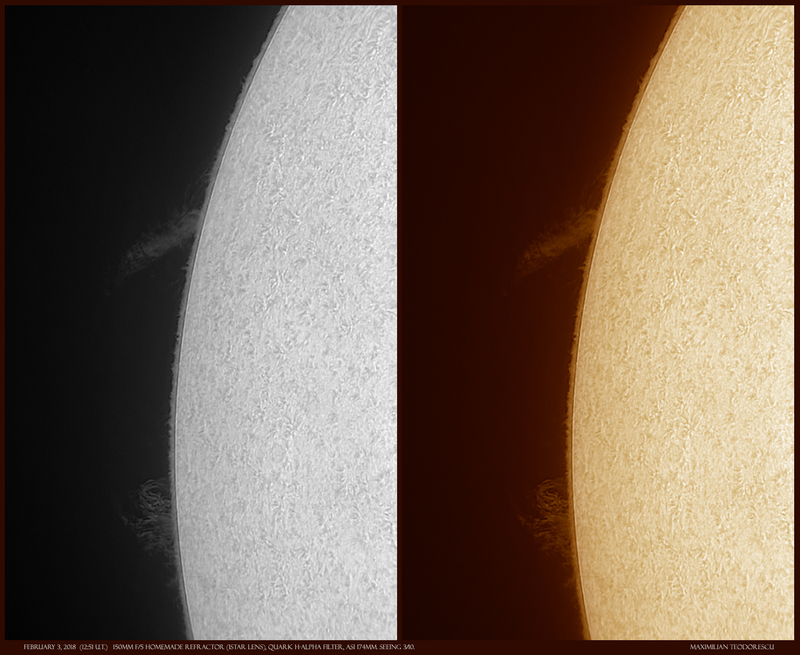 My first shots in H-alpha with the Sun for 2018. 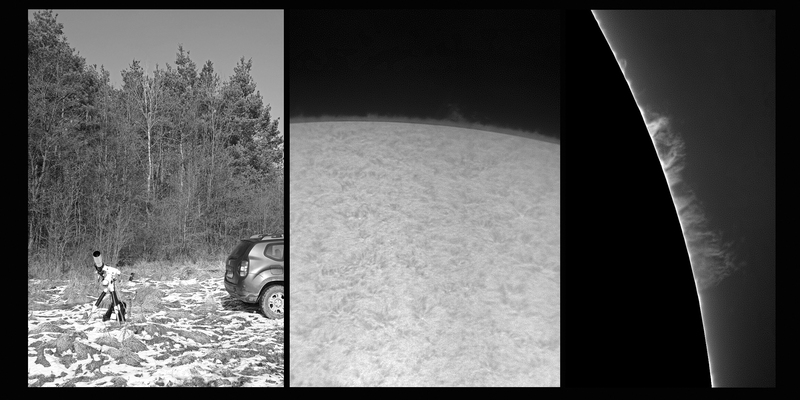 Not the best day for solar imaging, with our star at only 20 degrees above the horizon, and some very poor seeing. 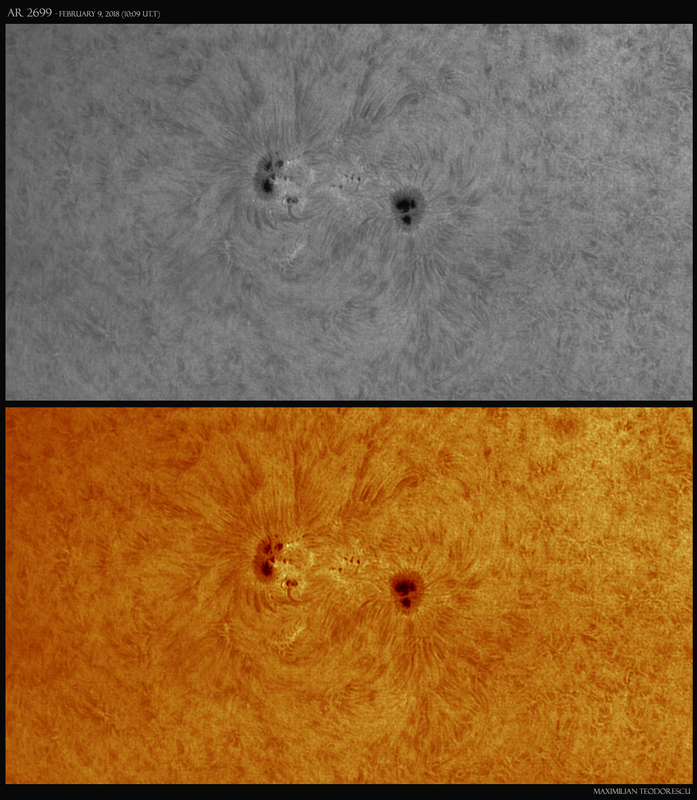 Despite this, two rather large proms were easily visible on the limb.